Update: The video hasn't appeared on the official Twitch or YouTube channels yet, but this unofficial version will do. Expect lots of Dendi hooks, Techies suicides and some ridiculous snowballs. It turns out Zeus' global nuke is slightly OP when you have so many players. 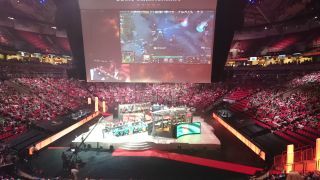 Original story: As part of the very loud, very silly All Star Match at this year's International, Valve has revealed that starting from next week custom game modes made in Dota 2 Reborn will support up to 24 players. This is a big increase from the current limit of 10, and a demonstration of what the Source 2 upgrade contributes to the game in general. There'll be some disappointment that this took the place of a hero reveal, but there's still time. Dota 2 reborn is scheduled to launch soon after the International and will include a full toolkit for building custom multiplayer modes. It's not yet confirmed that Valve will add the custom mode used to play tonight's All Star to the Reborn Beta, but it seems likely. The match only just finished, but you'll be able to find the VOD fairly soon on the official Dota 2 Twitch channel. Check out more of our International coverage right here.